Greenway, a beautiful Georgian mansion set amid 32 acres of gardens a mile above Dartmouth on the Dart River in Devon, was Agatha Christie’s holiday home. For 400 years this picturesque spot has attracted owners who cultivated its gardens, which contain over 2700 rare specimen plants. A Tudor dwelling was built in 1535 and was replaced with the current Georgian residence in 1791. 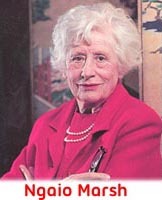 Dame Agatha purchased the house in 1938 and in 1959 transferred the estate to her daughter Rosalind Hicks, who owned it jointly with her second husband Anthony Hicks and her son Mathew Prichard. In 2000 the Hicks family gave the house and grounds to the National Trust. The gardens were opened to the public in 2002 and the house will open in 2009. Our virtual tour will include pictures of the interior of the mansion with Christie’s furnishings as well as the gardens. The whodunit whose action can be most closely traced at Greenway is Dead Man's Folly, in which murdertakes place during a garden fetê while a treasure hunt devised by the detective novelist Ariadne Oliver is in progress. When she suspects foul, she summons Hercule Poirot to prevent disaster. Join Poirot as he strolls about the garden looking for clues and chatting with pottential villains. The Privy Garden at Greenway, a small formal garden enclosed by high holly hedges with only one enterence, is the scene of a double slaying in this vintage country house murder mystery. Action occurs both inside the house and in the grounds. The enigmatic Mr. Harley Quin assists Mr. Satterthwaite to overcome the superstitious spell cast by a resident ghost and preceive the prractical solution to the crime. One of Britain's most popular exports is the murder mystery -- especially the 'classical' English detective story. Since the 1920's, respectable, middle class English women have been committing murder on paper to the delight of millions of readers. Oddly enough, in this genre -- the literature of violence -- English women writers excel. Whatever the reasons for their success, it is important to remember that women crime writers have conquered a fictional world that is the antithesis of the traditional feminine realm -- violent, ruthless, physically active, fiercely competitive, and stringently logical. 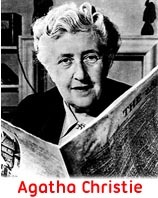 The generation of authors who emerged during the Golden Age of crime fiction between the two world wars -- Patricia Wentworth, Agatha Christie, Dorothy L. Sayers, Ngaio Marsh, and Margery Allingham -- is best known. (Josephine Tey, who is sometimes mistakenly grouped with them, published mostly in the 1940's and 1950's.) These women constitute a recognized group, if not a formal school, whose craftsmanship has earned praise all over the world. And as a group they enabled the whodunit to evolve into the whydunit. While observing the conventions of the classical detective story, each made a unique contribution to the development of the genre. By integrating setting and plot, enhancing characterization, and introducing serious social issues, they changed the crossword puzzle in print into a fully developed crime novel. 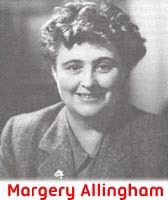 Critical acclaim and popular demand for their books in several languages continued throughout the twentieth century and show no sign of abating. It is curious, if not extraordinary, that women have achieved prominence in the literature of violence, and it is only natural to wonder about the reasons for this anomaly. Why is it that conventional, middle class English women -- presumably with no firsthand experience of violent crime, little training in forensic science or police routine, and scant knowledge of the criminal underworld -- are able to write such riveting accounts of murder? How can they know so much about the blood lust, primeval rage, and atavistic hatred that motivate murder? What special talents and insights they bring to their craft, and what they have contributed to the genre of detective fiction are intriguing questions to consider. Wherein lies the charm of these pied pipers? Perhaps the most often cited reason why people read crime fiction is that it provides vicarious excitement -- that ordinary people leading a rather mundane existence seek in print the adventure missing in their own lives. Moreover, half the pleasure is based on the fact that one knows the dangers are not real, that everything will come right in the end. In these novels the guilty are apprehended and the innocent exonerated. They are really moral allegories designed to assuage fears and build confidence in the existence of a just society. So the genre is reassuring as well as exciting.